After flooding the world with liquidity for the past decade, a growing number of central bankers in advanced economies are seeking a path back to dry land. Higher interest rates are needed to restore normalcy, in part so that rates can be lowered once again if another financial crisis hits. While few major economies exhibit exuberant growth, central bankers are a cautious lot; they like to take the punch bowl away just as the party is getting good—before it gets out of hand. 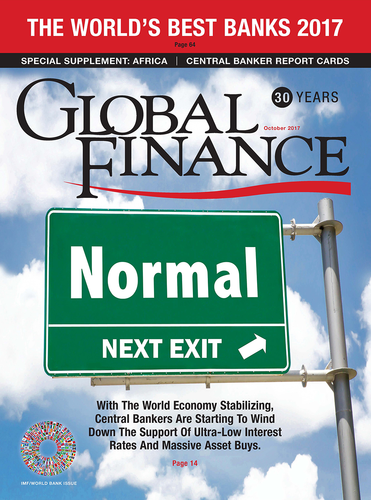 For 23 years, Global Finance has been grading central bankers on how well they do their jobs. Our ratings are largely based on inflation control, economic growth, currency stability and interest-rate management. Other factors taken into account are central bankers’ skills in supervising financial institutions and their determination to protect their independence in the face of political pressure. In this year’s report cards, we rate the performance of 83 central bank governors. While it is too early to grade the seven rookie central bankers who were installed most recently, Global Finance assessed the remaining governors on a scale ranging from A for head of the class to F for outright failure. We have added nine countries this year: Democratic Republic of Congo, Dominican Republic, El Salvador, Honduras, Jamaica, Myanmar, Nepal, Nicaragua and Tanzania. Emerging-market central banks may be more likely to lower rather than raise rates in the months ahead, as inflation remains subdued, according to economists at Capital Economics. In emerging Europe and Latin America, core inflation has been falling, as spare capacity in those regions’ largest economies—Russia and Brazil—has kept prices down. Inflation is likely to be at or below central bank targets in most emerging markets over the remainder of the year, Capital Economics forecasts. The firm’s aggregate measure of emerging-market inflation is at an eight-year low of 3%. Global growth is indeed picking up, yet signs of inflation are lacking in both wages and energy prices. Asset inflation has soared, however, with a huge boost from central bank purchases of $12 trillion, mainly in government bonds, in response to the financial crisis. Unwinding these massive positions will be done gradually over time to avoid triggering market declines—such as the Taper Tantrum in the summer of 2013, after the Federal Reserve announced it would begin reducing its purchases of bonds and mortgage-backed securities. “The global recovery is firming up,” Draghi said, adding that in Europe and Japan, “the consolidation of the recovery is at an earlier stage” than in the US. He gave no indication of when the ECB would end the eurozone’s $2 trillion bond-buying program. *CB governor was not graded in 2016 **Applied to a prior CB governor.